A 1920s bungalow that is street-facing had a rear addition added by a previous owner. The addition created small, dark rooms with low ceilings that disrupted the flow of the house. Worse, it blocked sunshine, airflow and even the views to the wooded backyard. 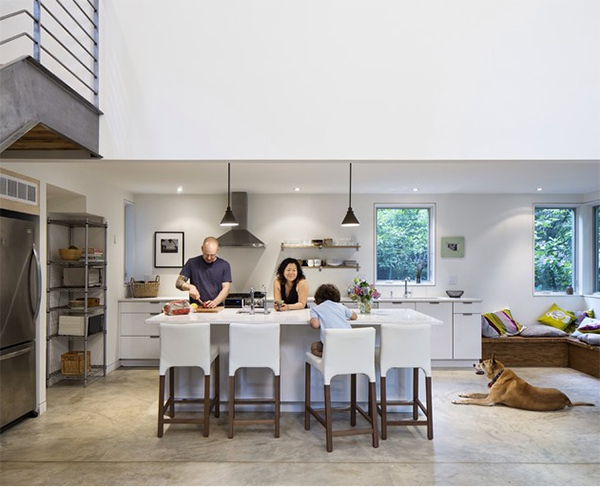 This not-so Bungalow house is about 2,500 square feet (232 square meters); 3 bedrooms; 2½ bathrooms located at Takoma Park neighborhood of Washington, D.C.
Jeff Dorn and Airi Maeno hired architect Wakako Tokunaga to help them with their problem regarding the house. The architect ripped off the old addition and started over with a double-height glass wall to give the area light, air and views. “It’s a very simple idea but solves all of the problems the clients came to me with,” Tokunaga says. 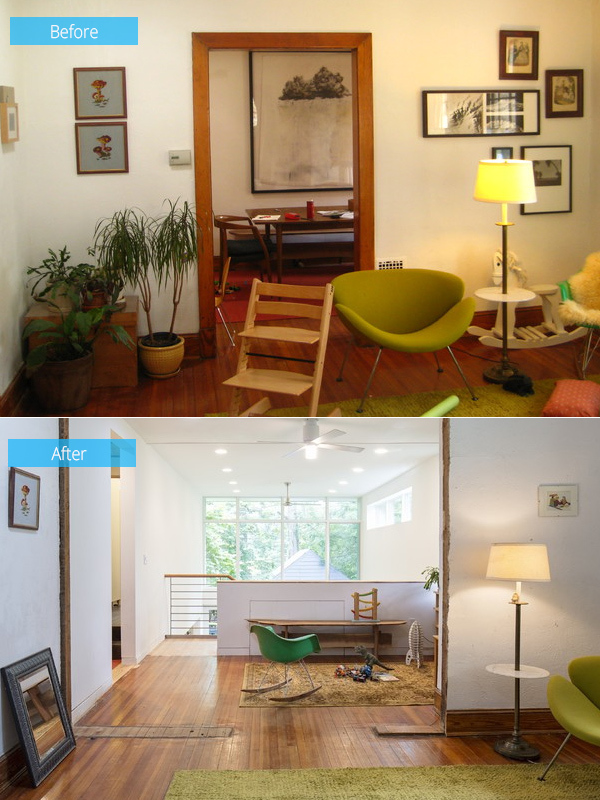 The renovation of the house actually turned the dwelling into a space that is cozier and pleasing. You can see that in the images below. 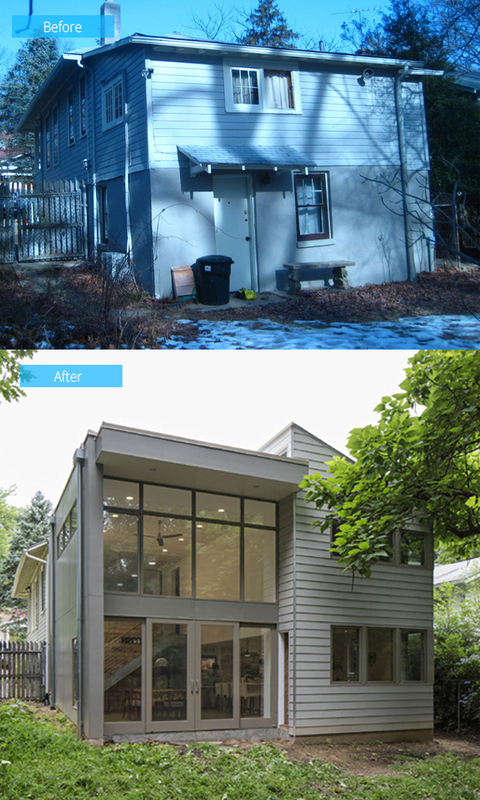 Before, the top of the addition held the bedrooms while the bottom portion of the addition was an unfinished basement. Natural light cannot enter to the areas and it wasn’t even structurally sound. After the renovation, a double-height glass wall and abundant windows allow light and fresh air into the house. The interiors also became more visually and physically pleasing with a view to the lush landscape. The entry to the home is on the second level that added to the disruption of flow. One would enter in the living room and then wind through a series of small, very dark rooms. Hence, the walls were removed to give a clear view to the double-height windows on the new rear addition. The chipped edges and unfinished floor was left that way to give it traces of the original house. The basement was unfinished and structurally unsound. For the new addition, it contains the dining room, Maeno’s art studio that is located beyond the reclaimed wall, a kitchen to the right and bedrooms above that. 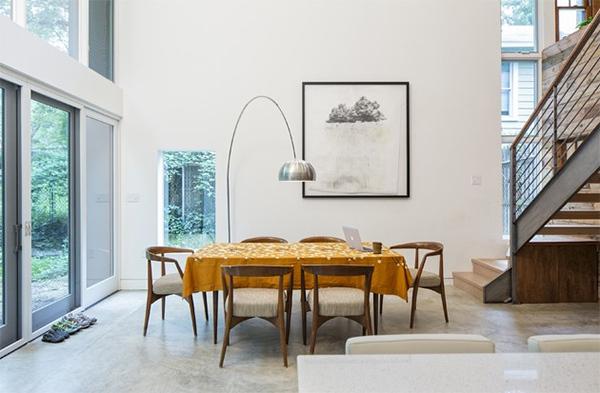 Midcentury modern dining table and chairs found online where used for this dining area with vertical windows. 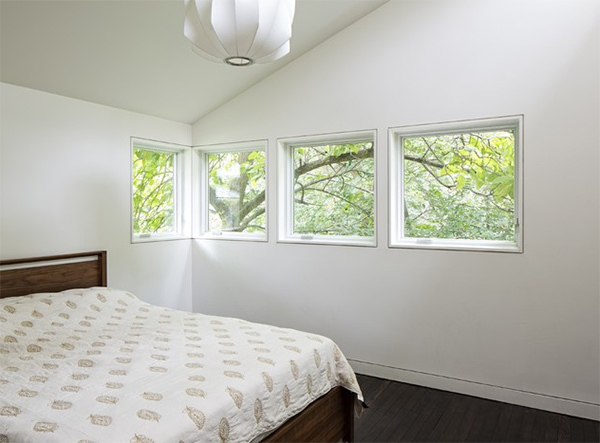 Meanwhile, the new master bedroom has windows that allow them to get a good view of the backyard. A new open concept keeps everything in the house airy. They wanted to have a central big open island where the family can gather and the kids can work on their homework. 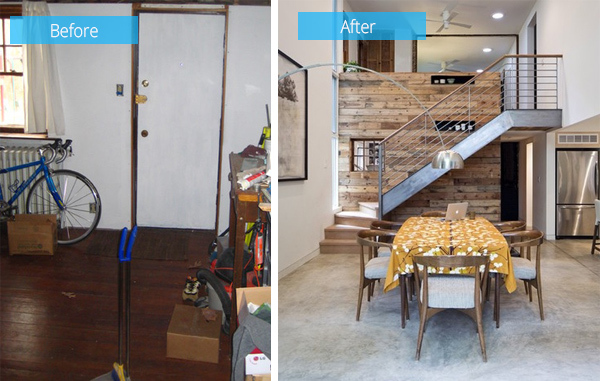 It is indeed nice to have a before and after photo of a house renovation because we are able to appreciate the new look even more. What can we say to this home? Well, architect Wakako Tokunaga answered the problem of the homeowners and they can already enjoy their new home that is more airy and brighter! Even the look of the exterior is so far from how it looked before. And the interior is indeed very beautiful and contemporary.